It’s been a century since the philidor was a popular defense in top level chess, however, despite its reputation for passivity it still makes an occasional debut here and there in modern day tournament chess. Personally, I am not someone who seeks to punish my opponents for playing a less fashionable defense, and so i usually play the quiet lines with 1.e4 e5 2.Nf3 d6 3. d4 exd4 4.Qxd4 Nc6 5.Bb5… usually after 5…Bd7 I capture on c6 and play for a nagging long term advantage. However, some people like to try and blow their opponent off the board, and certainly the author of “Fire On Board” falls into that category. If the main lines against the philidor aren’t sharp enough for your taste, and you really want to throw the kitchen sink at the philidor, consider Shirov’s 5.g4 gambit as in the following game. The ideas behind this gambit are similar to the ideas behind Shabalov’s gambit in the meran semi-slav, but way crazier. The time Black spends capturing the g-pawn as well as the open g file are white’s compensation for the material. Naturally, if black doesn’t capture the pawn, then it can be the harbinger of a nasty kingside attack. After Nxg5 6.Rg1…white’s rapid attack starts to take shape. 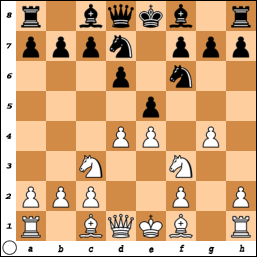 White will open the d-file with dxe5, and place his bishop on c4- preparing to sacrifice it on f7. After the Bxf7+, if the king takes the bishop, the knight on f3 comes to g5, giving check, and coordinating with the white queen. This can lead to a quick and devastating attack if black does not play accurately. Any slow moves on blacks part would allow white to deal the final blow by either penetrating with his queen, or bringing a rook to the d-file. The following game is a fantastic taste, and includes all of the ingredients necessary for the recipe of this attack. Obvoiusly, Black did not adequately defend in this game. His first error was 10…Qc7, when white’s bishop sacrifice on f7 allows White’s queen and knight to coordinate nicely on the light squares. Better was 10…Nh5, which seeks counter-play against the white king made possible by white’s missing g-pawn and marauding kingside knight. Immediate counter play is black’s only lifeline in the position, as in the following game where the exact same position occured after 10.Qd3, but where black found adequate counter-play with 10…Nh5. Even here, where black was able to draw, the poison in the move 5.g4 is still obvious. It is not a move for the faint of heart, but is definitely worth trying in your next blitz encounter with the Philidor.